I’m bringing you another 30 minute meal! They are my favorite! This is another one of our favorite take-out, but made-at-home meals. 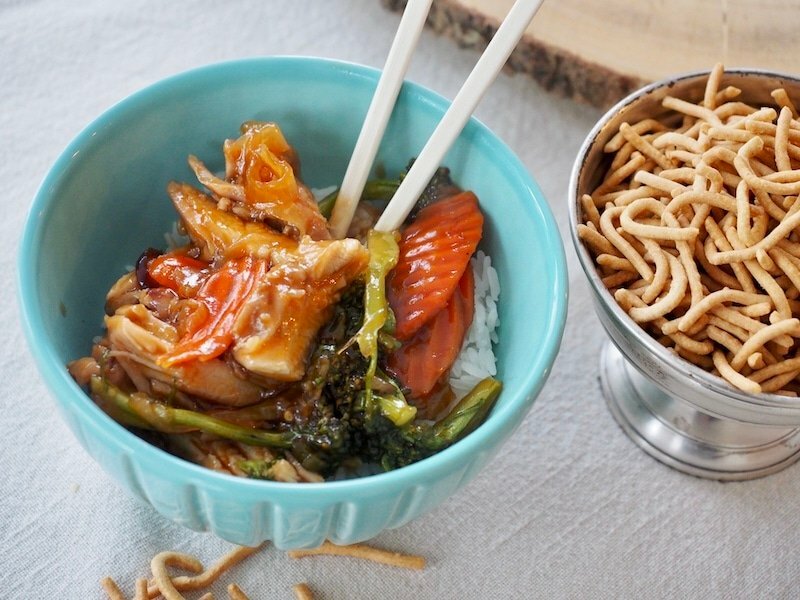 Saucy, sweet, tangy, Honey Bourbon Chicken with crisp broccoli and bright orange carrots. Steam up some rice for a quick healthy weeknight meal. TIP: Need to quick thaw your meat? While you are gathering all of your ingredients, toss your meat (place in a baggie if not already in vacuum packed bag) into a bowl of warm water, on the hotter side. Let it sit changing water out about half way through; it should be defrosted enough to work with in about 15-20 minutes. 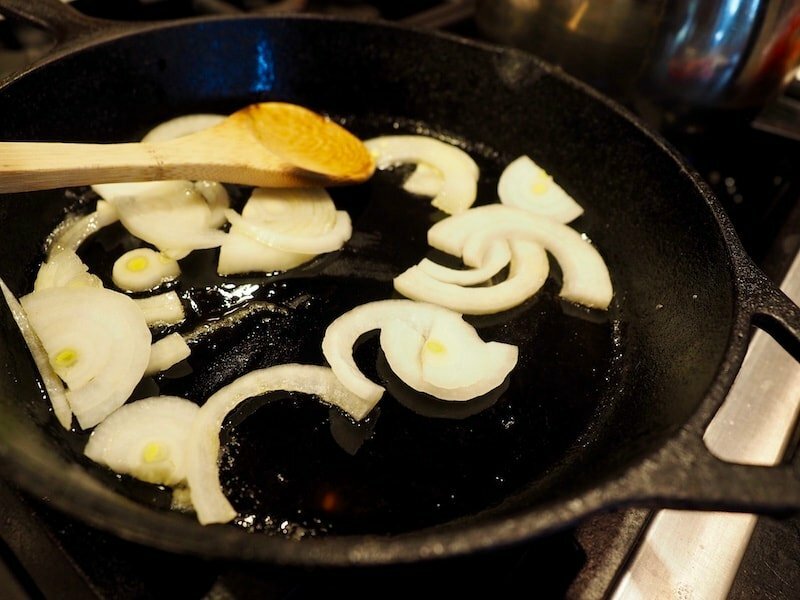 Swirl some oil (try using Toasted Sesame oil for an even more flavorful dish) into a hot pan and toss in your onions, sautéing over medium-high heat until soft and nicely caramelized. Add in your chopped garlic at the tail end of your caramelizing. 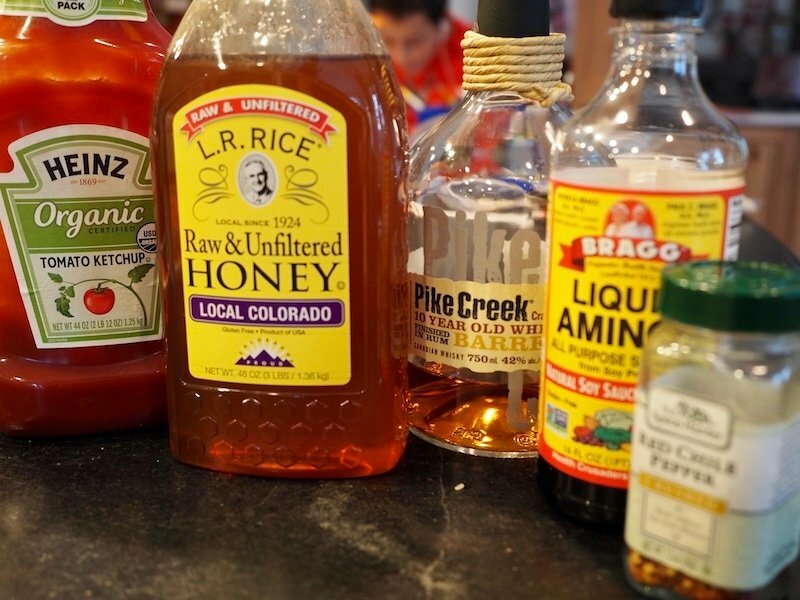 While your onions and garlic are sautéing, gather your sauce ingredients. Bourbon (or whiskey) is entirely optional! The chicken still tastes great without it. Measure your [amazon_textlink asin=’B077HJDT2M’ text=’honey’ template=’ProductLink’ store=’thefreshcoo0a-20′ marketplace=’US’ link_id=’07313812-75d5-11e8-8394-cf21cb47f6cb’] into a small bowl. I love using [amazon_textlink asin=’B002LMC300′ text=’Bragg’s Liquid Amino’s’ template=’ProductLink’ store=’thefreshcoo0a-20′ marketplace=’US’ link_id=’975718af-2729-11e8-af4d-6ba3316f64e4′] instead of soy sauce, but you can use soy sauce or [amazon_textlink asin=’B01BMYSNSS’ text=’Tamari’ template=’ProductLink’ store=’thefreshcoo0a-20′ marketplace=’US’ link_id=’e7a1627f-75d4-11e8-82e1-b3fbbe16b47d’] or GF soy sauce. Your [amazon_textlink asin=’B0082313JE’ text=’red pepper flakes’ template=’ProductLink’ store=’thefreshcoo0a-20′ marketplace=’US’ link_id=’c2c05054-75d4-11e8-a1db-abf49456f2f8′] (remember, I’m a wimp, so shake away if you and your family like more heat). If desired, add in your bourbon at this point and whisk until it’s combined. Set sauce aside. Salt your chicken, I love to use boneless, skinless chicken thighs for this recipe, it’s so juicy and tasty. But you can certainly use boneless, skinless chicken breasts if desired, just don’t cook as long. 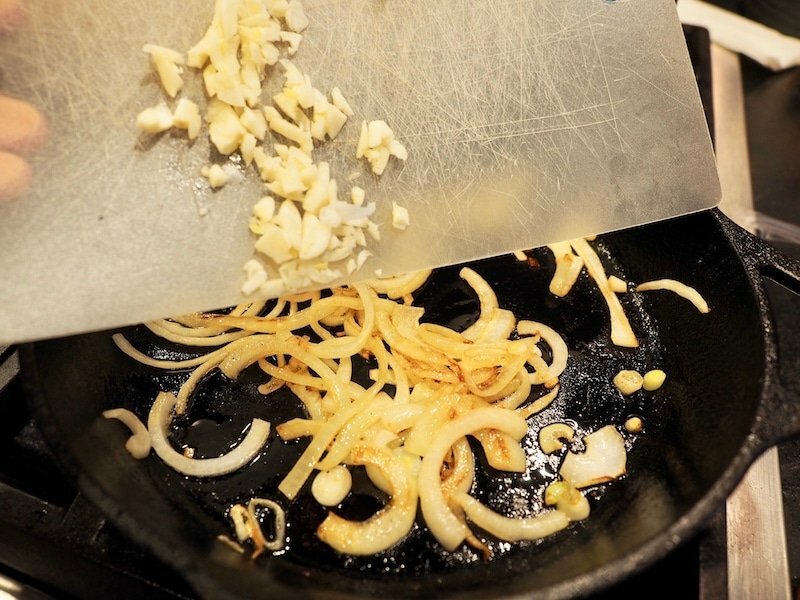 Scoot your cooked onions and garlic to the side of the pan and if needed, add in a bit more oil. Increase heat to medium-high, add your chicken. Turn after a few minutes, browning both sides. Add in a handful of sliced carrots, shredded carrots or chopped carrots, whatever you have on hand. Stir it all around, sautéing the carrots slightly. 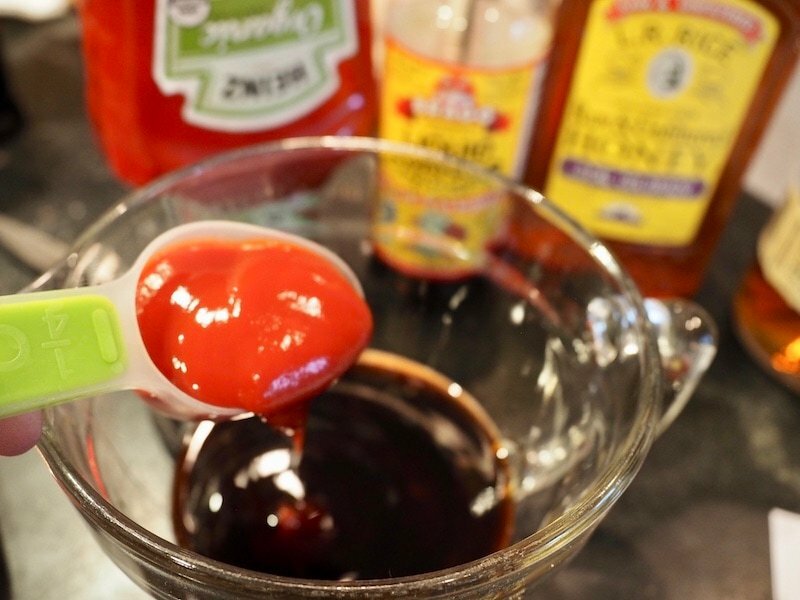 Pour in your sauce, stir around and bring to a simmer. Bring to boil, reduce heat and simmer over low heat for 20 minutes or so, turning chicken around 15 minutes until your meat is cooked. 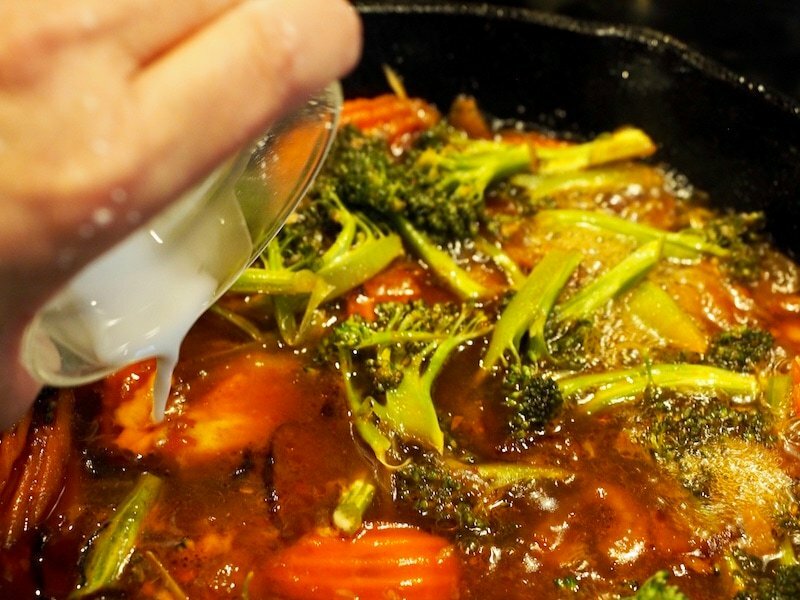 Toss in your broccoli florets and simmer with lid on for 5 minutes, stirring occasionally until crisp tender. 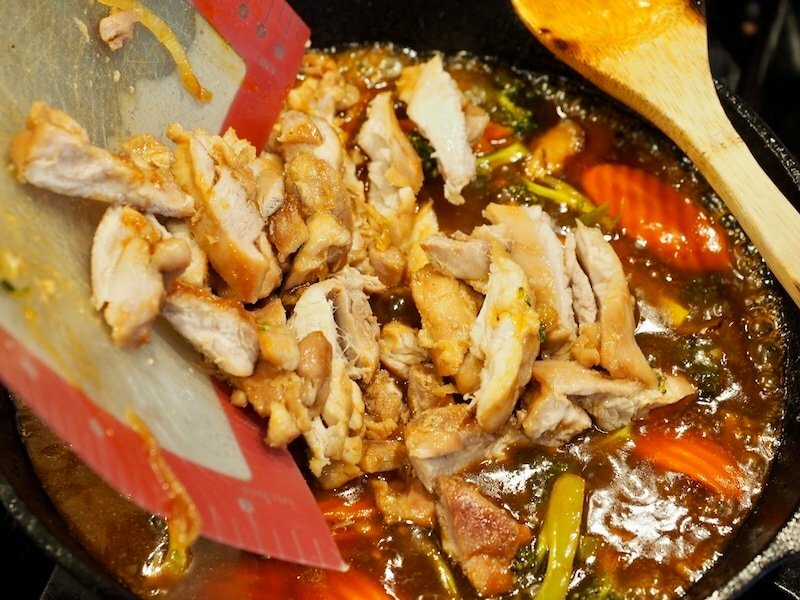 Once chicken is cooked, remove thighs from sauce to cutting board. 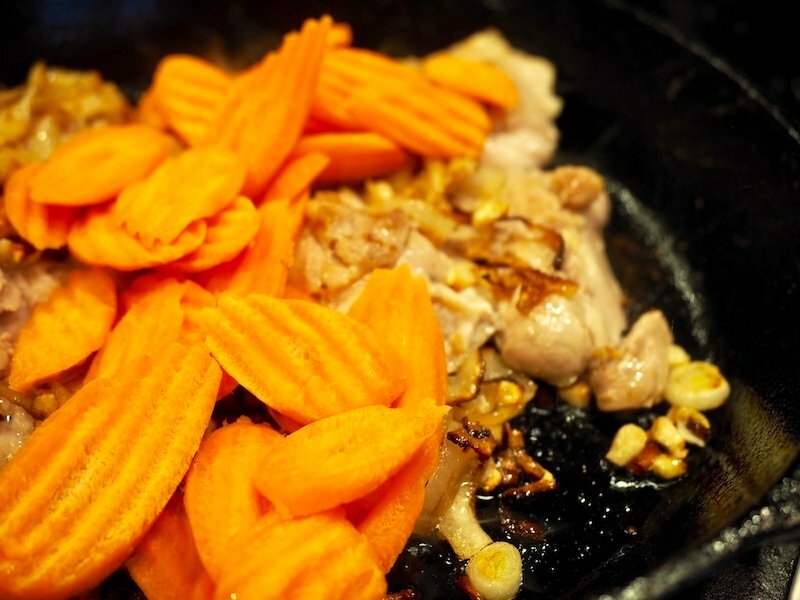 Slice chicken into thin strips and return to simmering veggies. 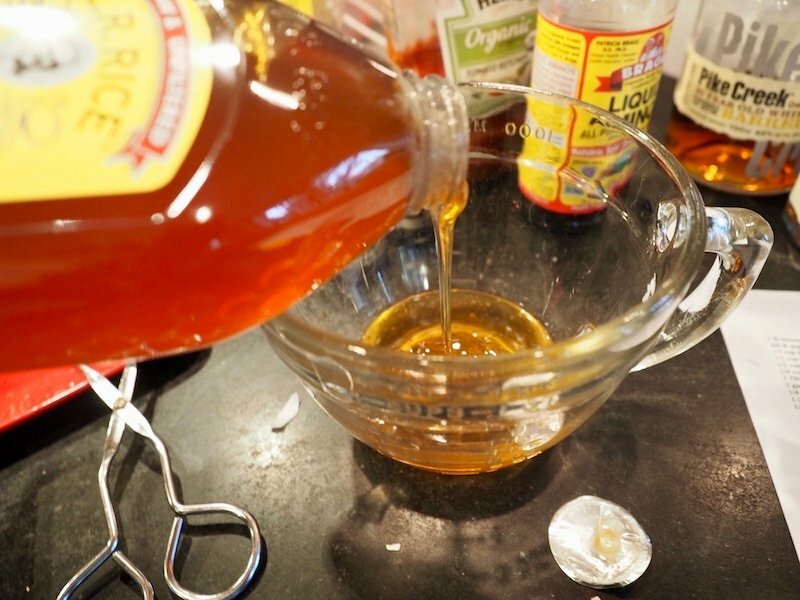 Quickly make a corn starch slurry by combining your corn starch and water with a spoon or a whisk. Pour into chicken and sauce mixture, stir to simmer until thickened. This is my most often used [amazon_textlink asin=’B00FYL4MPY’ text=’small liquid measuring cup’ template=’ProductLink’ store=’thefreshcoo0a-20′ marketplace=’US’ link_id=’9ad58135-75d4-11e8-808c-ef0858512afa’]. Quickly stir to combine over medium heat. 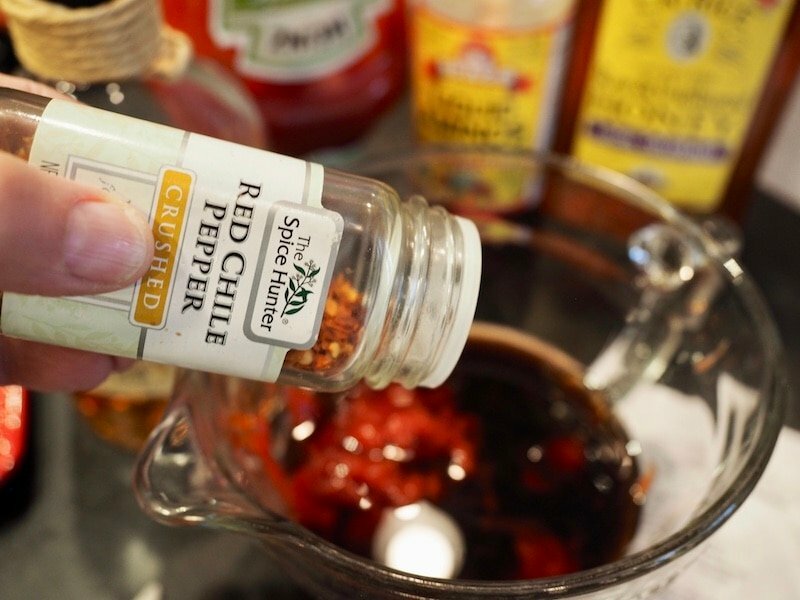 This will thicken your sauce and develop a beautiful gloss. 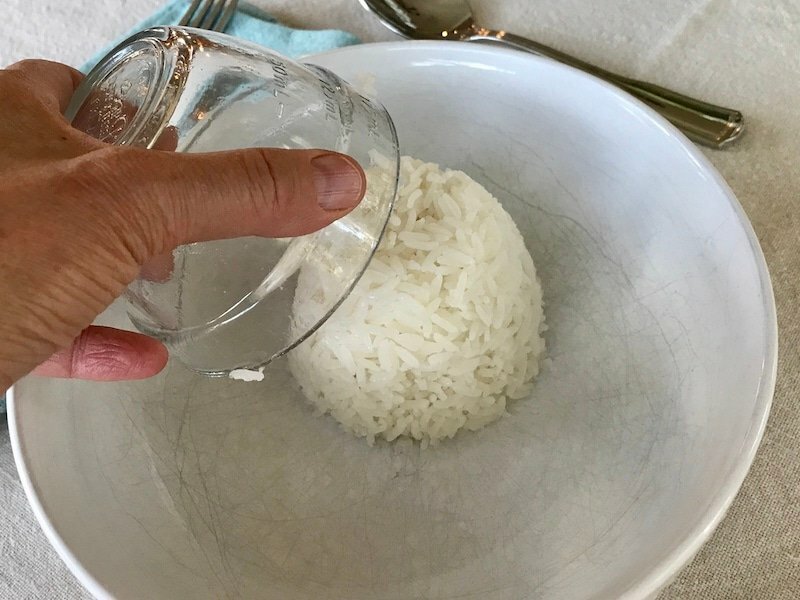 Serve immediately over steamed rice. We love making “rice cakes” by scooping sticky rice into small bowls and inverting them onto our plates. Like this…kids love this! 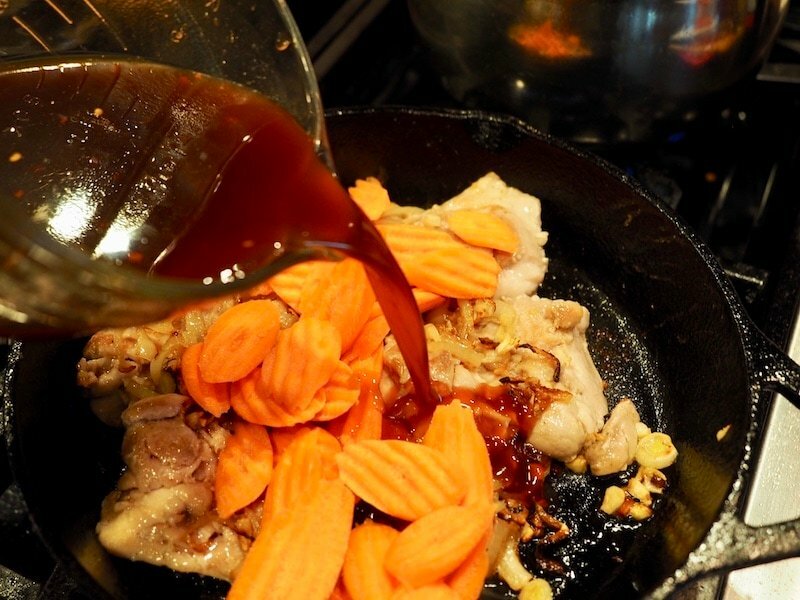 Scoop some of the honey bourbon chicken mixture over the top fo the rice into the bowl. 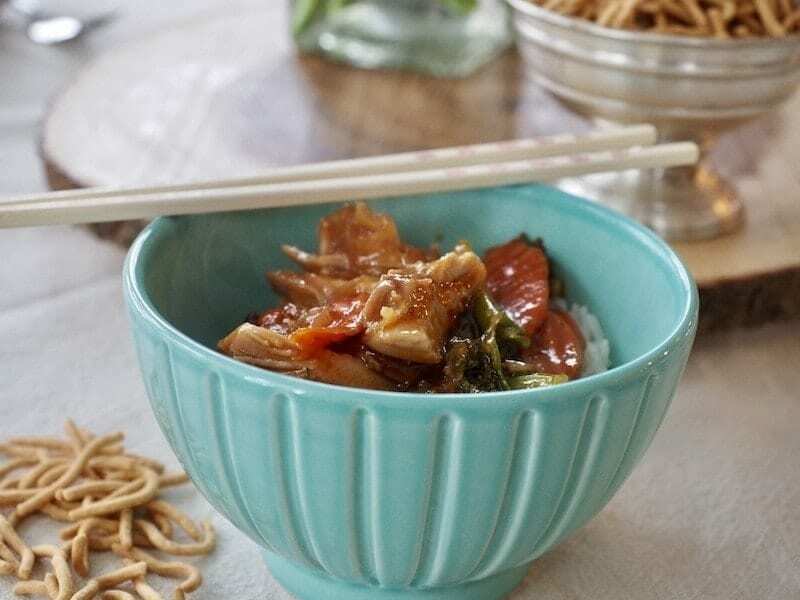 Or using smaller bowls, scoop in some rice and your honey bourbon chicken, sprinkle with crispy chow mein noodles and serve. Serve family style, I almost always bring the [amazon_textlink asin=’B00006JSUA’ text=’pan’ template=’ProductLink’ store=’thefreshcoo0a-20′ marketplace=’US’ link_id=’5d4af4e4-75d4-11e8-bcff-656c7a15f77c’] to the table! One less bowl to wash. Recommended to make life easier! 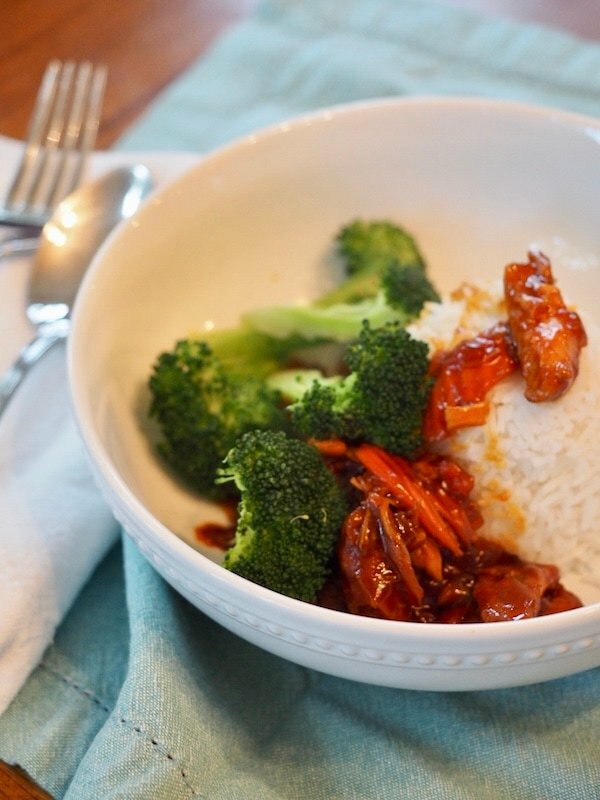 A 30 minute recipe for honey bourbon chicken. 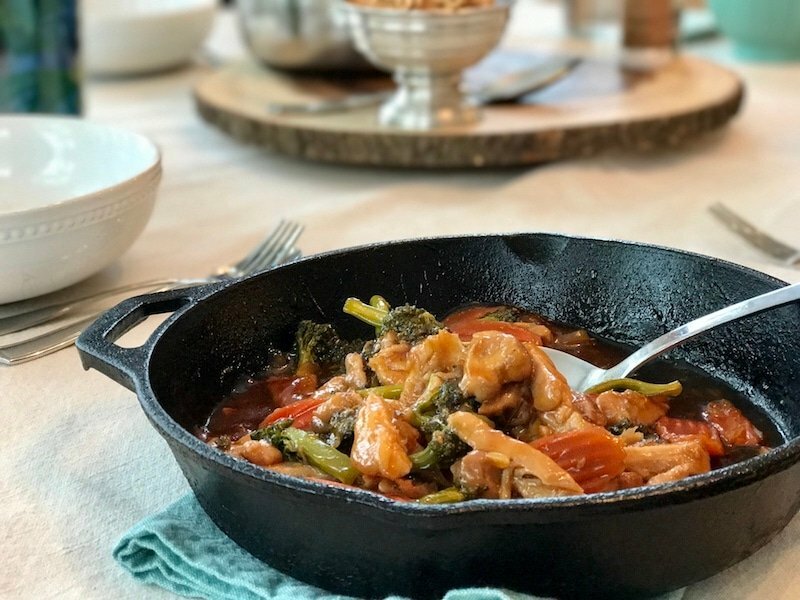 Sticky, tangy, sweet and tender chicken with crisp broccoli and carrots. Serve over rice and you have dinner. Heat oil(s) in large saute pan. Toss in onions and saute for 5-10 minutes until caramelized and browned. Add in garlic and stir for a couple of minutes until fragrant. While onions are caramelizing; mix together sauce ingredients in medium bowl. Honey, soy sauce, ketchup, bourbon (if desired) and red pepper flakes. Mix and set aside. Salt & pepper chicken thighs. 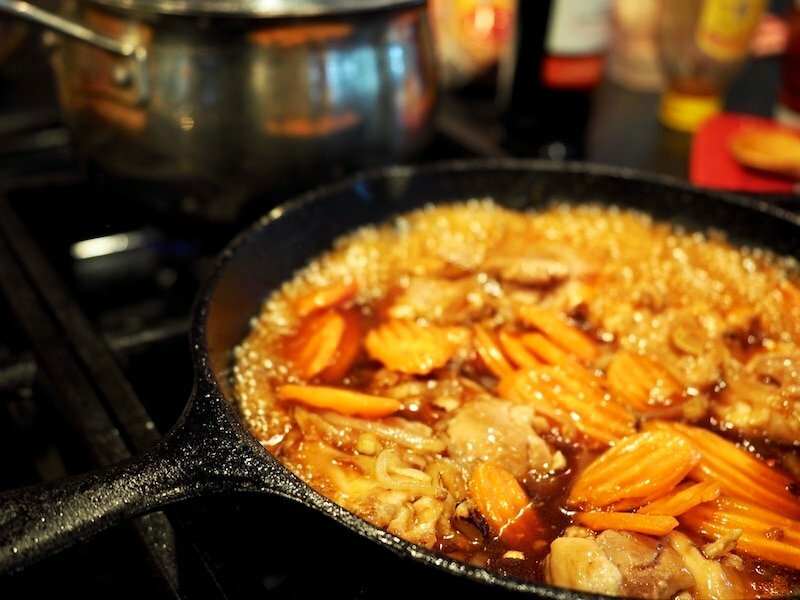 Move onions to one side of the pan and brown thighs* on each side for 1-2 minutes. 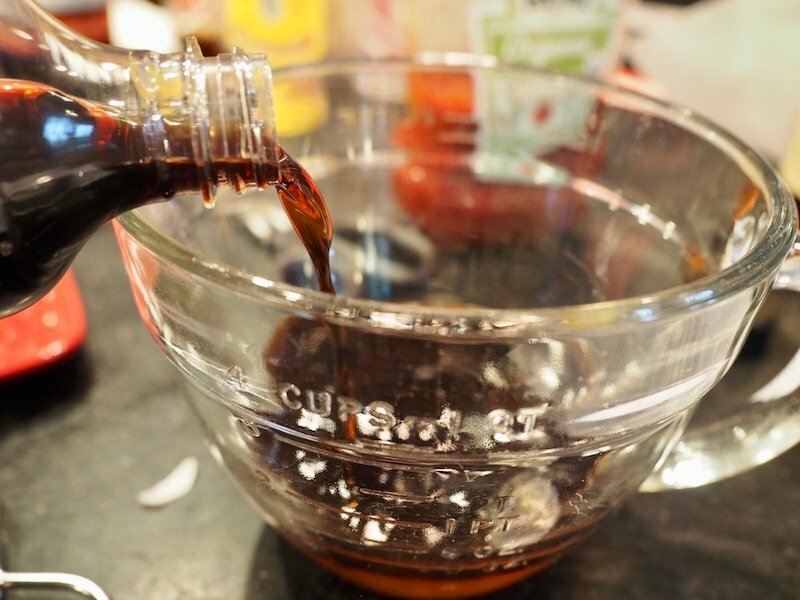 *Add a tablespoon more oil if needed. Toss in carrots and stir to combine. Pour in sauce, stir, mixing in onions. Simmer for 20 minutes, turning chicken about 15 minutes. May cover or leave uncovered. 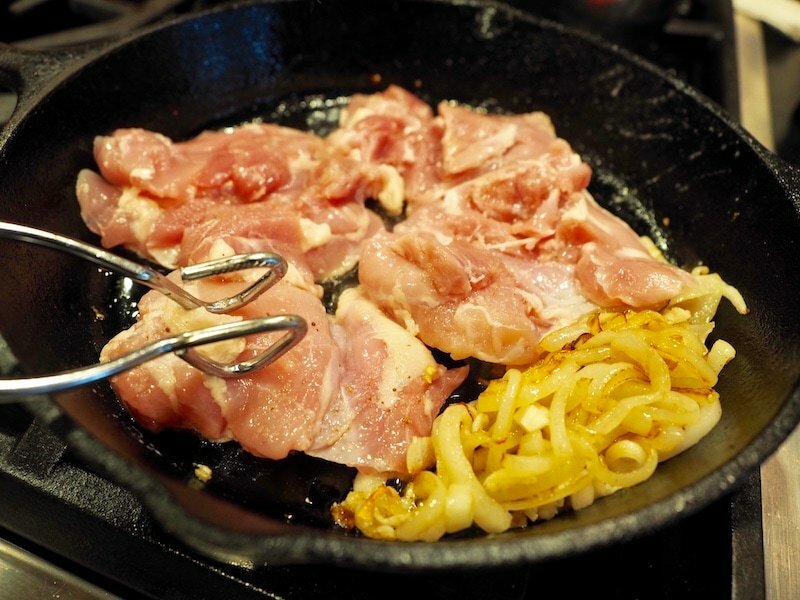 Remove chicken from pan to cutting board and slice into thin strips or bite size pieces. Set aside. 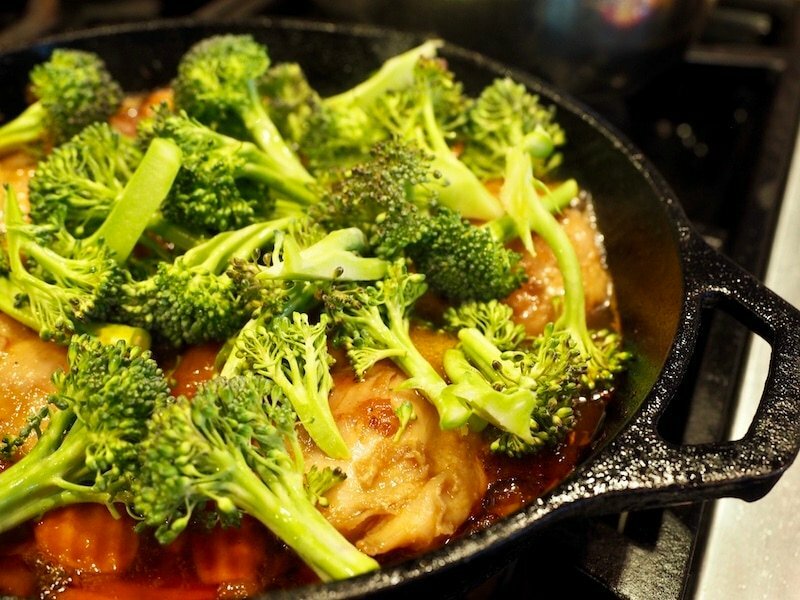 Add broccoli florets to pan, stirring to combine, cover and cook for 2-3 minutes until crisp tender. Return chicken to pan, stirring to combine. Pour into chicken dish, stirring and simmering until thickened and glossy. If too thin, add another tablespoon of cornstarch/water and stir to thicken. Serve immediately over steamed rice for a hearty, two pot meal. 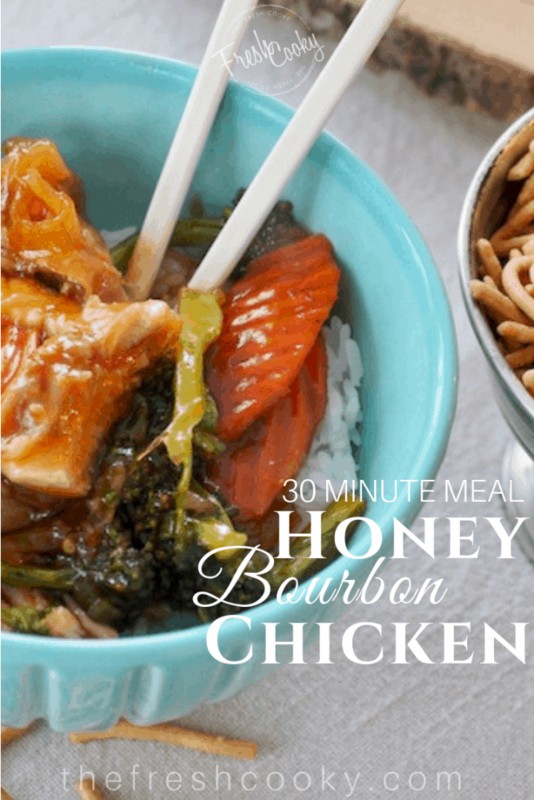 © 2018 | This recipe for Honey Bourbon Chicken was featured first on The Fresh Cooky. YAY! Give it a try Bob, 30 minutes will feel like 30 seconds and before you know it you’ll be eating a juicy, tasty, delicious dinner!